Head coach Gregor Townsend is confident Glasgow can become the first team in Pro 12 play-offs history to win an away semi-final on their return to Galway. The Warriors' nine-match winning run came to an end with Saturday's 14-7 defeat by Connacht at The Sportsground. That saw them slip from top spot to third behind Leinster and Connacht, who they face again on Saturday, 21 May. "I'm a big believer in what this team is capable of. They will have learned a lot today," Townsend told BBC Scotland. "It's a case of who learns the most between now and when we come back in two weeks, and who puts in a performance full of effort, energy and intelligence. "We will be determined to play better in a couple of weeks. We made more mistakes than we have been in recent weeks. Part of that is down to the weather; it was tough conditions, but we have to play the conditions slightly better. "The effort was excellent and I was proud of the way we came back at the end and almost got the draw that would have got us back home in the semi-final. "Connacht knew they were in a game, but I am sure they will be better in a couple of weeks too. So we have just got to make sure we are better than them." Townsend could be without prop Sila Puafisi for the return fixture in a fortnight after the Tongan tight-head was sent off for what referee Ian Davies deemed to be "serious foul play". Puafisi went through a ruck head first in the 50th minute and collided with the head of Connacht scrum-half Kieran Marmion. "Sila came in to clear the contact and it looks like it was head on head," Townsend said. "I think it was because it was out in the open and maybe after the whistle. It went to the TMO, and that decision was made. "There were a few of those clear-outs during the game where it becomes head on head. I am fairly certain he was trying to clear the contact but he shouldn't have come in because it was potentially after the whistle." In the six years of the Pro 12 play-offs to date, none of the 12 away sides have made it through to the final. 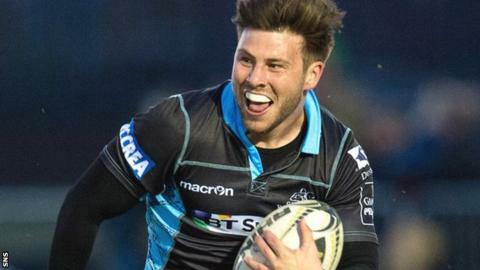 Glasgow lost away to Ospreys in 2010, and to Leinster in both 2012 and 2013 before coming through home semi-finals against Munster and Ulster in the last two years. "That just drives us on more - the chance to create history and ultimately make it to Murrayfield [which will host the final on 28 May]," scrum-half Ali Price told BBC Scotland. "That is our goal and that is what we will be preparing for now. We are pretty gutted at the moment but we were not a million miles away. "We can get better, we know we can. There are areas where things didn't quite go right for us today but we are a good team and we will bounce back."